Australia was declared free of measles in 2014. Yet this summer we've seen nine cases of measles in New South Wales, and others in Victoria, Western Australia, South Australia and Queensland. High vaccination rates in Australia means the measles virus doesn't continuously spread, but we still have "wildfire" outbreaks when travellers bring measles into the country, often unknowingly. If you haven't received two doses of measles vaccine, you are at risk of contracting measles. If you're not immune to the virus, through vaccination or past infection, the chance of becoming ill after being near someone with measles is 90%. Being in the same café, waiting in line at the checkout or flying on the same aeroplane as an infected person could be enough to pick up the disease. It's important to have two doses of MMR vaccine, especially if you haven't reached your mid-50s. Most people older than this would have been infected with measles before vaccination was routine. While we've had the measles vaccine in Australia since 1968, a two-dose program was only introduced in 1992. A brief school-based catch-up program from 1993 to 1994 offered school children a second dose. Another school-based program provided children with catch-up vaccinations in 1998*. Even if you can't be sure of past vaccinations, it's still safe to have an extra vaccine. And it's free for those who need a catch-up dose. 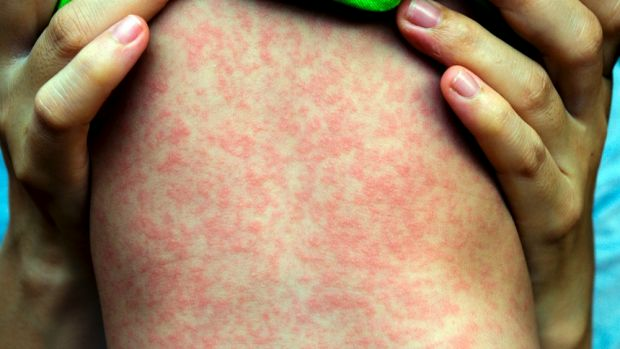 If you have a child under 12 months of age and you're heading to a country with measles, an early additional vaccine dose can be given to protect your baby from measles. This ideally should be done at least a month before you travel, to ensure an immune response has time to develop. The routine scheduled doses at 12 months and 18 months will still need to be given later. What if you're not protected? If you think you've been exposed or may be ill from measles, see your GP or call Health Direct or your public health department as soon as possible. If exposed, but not yet ill, it may not be too late to get a protective vaccine and ensure you don't spread the disease to others. A continued global coordinated effort will be required to maintain elimination and prevent resurgence of this deadly disease in Australia. Kristine Macartney is a Professor, Discipline of Paediatrics and Child Health at the University of Sydney. Lucy Deng is a Staff Specialist Paediatrician, National Centre for Immunisation Research and Surveillance; Clinical Associate Lecturer, Children's Hospital Westmead Clinical School at the University of Sydney.